We make sure no soapy residues, harsh chemicals or, excess water is left behind as these substances can actually cause more problems. We use high powered "Rotary Jet Extraction" heads that thoroughly clean the carpet from all directions with hundreds of cleaning passes. Our process is safe for all carpet types and uses a highly effective and efficient "Hot-Water Extraction" method commonly referred to as "Steam Cleaning". 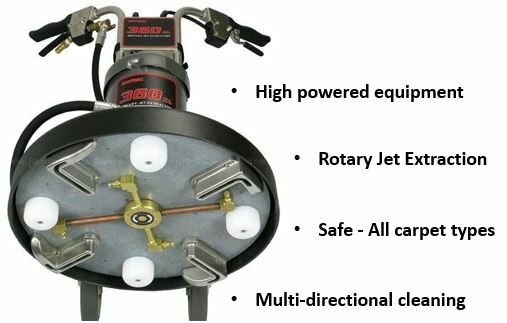 Our process is an upgrade to traditional steam cleaning that, only cleans in two directions. We use enzymatic cleaning agents that destroys pet odors and bacteria at their source. These are best in class products that have been specifically designed for removing odors caused by urine and other offensive matter. Our products use natural bacterial enzymes that find and destroy offensive odors, instead of masking them. This formulation contains no harsh chemicals, it is non-toxic and safe for use in the home. Your furniture like your carpets, rugs and other soft materials collect dirt, allergens, and stains. By keeping your furniture clean, free of allergens and pet dander, it will last longer. Clean carpets and upholstery can also, prevent allergies from flaring up whenever you’re at home. Our process makes upholstery clean without damaging the delicate fabrics. Fabric Protection - At the time of cleaning ONLY...You can add this additional service to render your upholstery water- and oil-repellent and stain-resistant. We will perform "In Home Area Rug Cleaning" Only. Our process makes rugs clean without damaging the delicate fabrics. Please note: Because, these are in-home vs. off-site services the cost is 50-75% less to you. However, once we place carpets in your preferred drying location, you are responsible for putting the carpets back once they have dried.